Krishnagiri: The 23rd All India mango festival held at the playground of the Krishnagiri government boy's higher secondary school concluded on Sunday night. Around 3.5 lakh people visited the festival which began on June 5 and continued for 24 days till Sunday. More than 30 farmers displayed the mangoes produced by them in the festival. Besides, the government departments, agriculture research institutes, agri related inputs, value added products manufactured out of mango were on display. 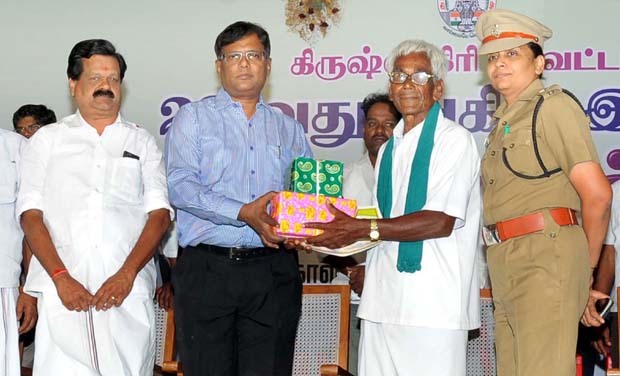 The Krishnagiri Collector T.P.Rajesh gave away prizes for 27 farmers for producing quality mangoes. The Horticulture department bagged the first prize, Police department was given the second prize, the municipality and the agriculture department received the third prize for promoting government schemes and achievements. Rajesh, in his speech, said Rs 500 crores worth capsicum and cut flowers are exported annually from Krishnagiri was achieved because of the schemes introduced for the farmers by the Chief Minister J. Jayalalithaa. The Krishnagiri MP K. Ashok Kumar said Tamil Nadu under the leadership of J.Jayalalithaa helps the country to earn Rs 300 crores annually because of the export of the mango pulp from Krishnagiri. This was achieved because of the introduction of the modern agriculture methods including drip irrigation system.